The lit up Old City of Dubrovnik stood out in the darkness of night. But, the city did not sleep that fast! Still the Old City of Dubrovnik was full of people, enjoying nice live music and roughing. Dubrovnik at night is very lively! 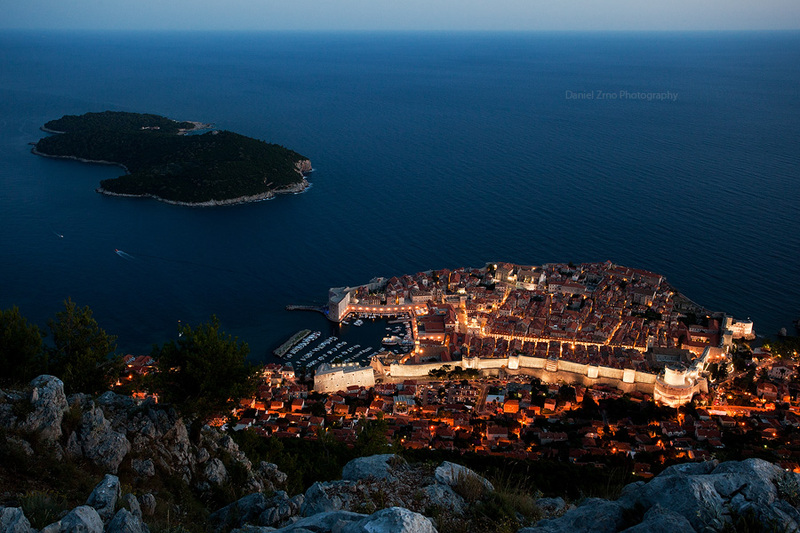 It's usually around 8 to 9PM when it gets dark in Dubrovnik at the highest tourism season (July to August). After the sunset, the temperature drops and cool air breeze from the Adriatic Sea, people enjoy dinner and drink at outside tables of restaurants and cafes. Generally, coastal cities have very good seafood restaurants, and their food are bit influenced by Italian food, so mostly, restaurants serve really good and tasty food. Each narrow streets are full of restaurants and cafes. Compared to the main street, it's quieter on small streets. So, you can relax and enjoy your dinner and great night of Dubrovnik. This atmosphere and view, I mean, so many tables on the streets and people eating there while other people pass by looks very unique for us Japanese and that is something we miss in Japan. This is the Big Onofrio's Fountain. There are many people sitting there to relax near the cold water during daytime, but now, this site seems very quiet at night. In the Old City of Dubrovnik, many souvenir shops, small grocery shops, restaurants and cafes open until late at night. It was actually very convenient. So many people go by in front of the Orlando's column. We visited just before the holiday season started in Europe, so Dubrovnik was not to crowded. But, during the peak of the holiday season, many cruisers call at Dubrovnik and bringing thousands of passengers to the city. At the peak of this year, 7 cruisers arrived at Dubrovnik port and brought nearly 10,000 people one day! So, you know, how packed the city will be at the peak of the summer holiday season. When I looked at the watch, it was already midnight! Time flied very very quickly while I enjoy walking around the city. It seemed like the night would not end that soon, but because I wanted to wake up early to explore a bit more of the city while avoiding the strong sun in the afternoon, I went back to the hotel soon after I took this photo.